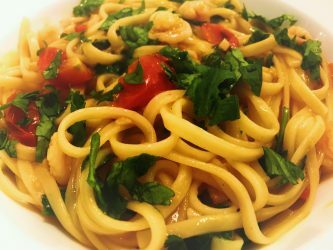 What To Do With …..
We all love a quick and easy pasta recipes and this Prawn Coriander Linguine is just that. With the addition of the prawns, the meal feel luxurious and is stirred together in minutes. This is great if you are having friends round for a mid week meal and the dish can be easily adapted for dietary needs be it, Paleo, Gluten Free, Keto and Celiac diets, just swap the wheat pasta for courgette or squash pasta. The secret to this recipe is the coriander, I have tried the recipe with parsley and to be honest, it just is not the same. The coriander although not traditionally Italian, brings the whole dish together in a different and fresh way. A quick simple and delicious pasta dish that is tasty to serve to friends or eaten midweek as a family meal. Add either the butter or olive oil to a frying pan. Add the garlic and chilli and fry for a minute, or until the flavours are released. Add the tomatoes and warm them through they should still hold their shape, it takes less than a minute. Add the prawns to the tomato, chilli, garlic mix, until they are heated through, stir the pasta into the prawn and tomato mixture just long enough to bring the ingredients together. Place in individual bowls or in big dish and sprinkle with fresh coriander. Offer lemon to squeeze on top for those who enjoy a lemony zing. You can easily vary the amount of prawns you add, for a midweek meal 200g would feed a family of four easily. If you are catering for friends you may want to double or treble the prawns to add a real sense of luxury to the dish. The recipe is delicious either way. If you are catering for vegans you can make the pasta without the prawns, it is delicious. For Paleo, Gluten Free, Keto and Celiac diets swap the pasta for courgette or squash pasta. Next time you need to entertain mid week or fancy a different addition to your weekly pasta meal try this delicious quick and easy Prawn Coriander Linguine. Catering for friends and family, talking about food, finding new recipes and ideas, fills my creative soul. I have decided to indulge my passion through this Blog and I hope I can entice you to try what I love cooking and creating. Welcome to my eclectic world. Copyright © 2019 www.marissa.co/Marissa/ Marissa Ltd | All rights reserved.